Champagne, decorated with candies and other decorative elements, is an excellent gift that can be presented as a Supplement to the main gift for any occasion. 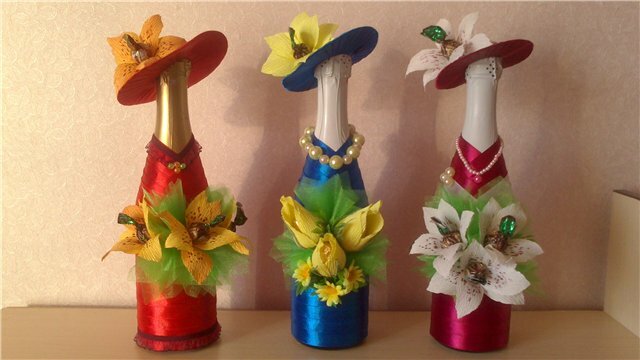 Decorate a bottle of champagne is not so difficult as it may seem at first glance. 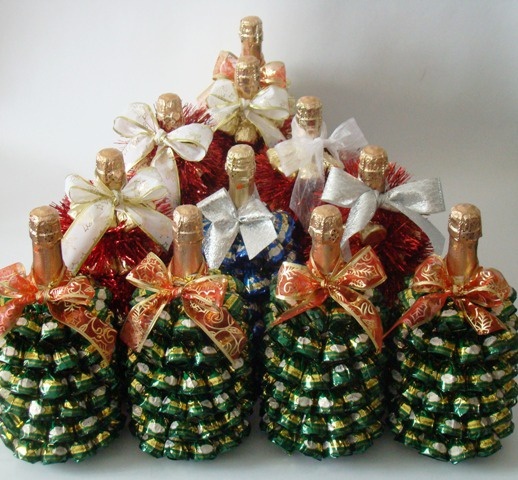 The first thing you need the whole bottle of champagne, except for the neck, glue colored tinsel. 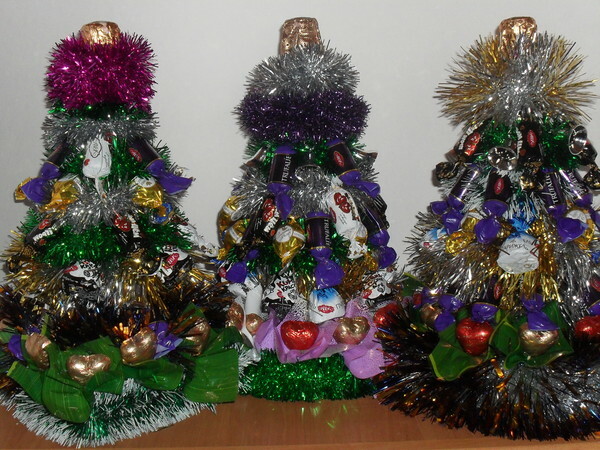 It is necessary to coat the whole bottle of glue and carefully wrap it all in a circle of tinsel on it. It is worth remembering that champagne looks more attractive in cases when bottom is darker tinsel, and on top lighter. Next, around the perimeter of the bottle between the tinsel stick candy. To do this, cut double sided tape into small pieces (about an inch), then separate the protective film of the adhesive tape with one hand and stick these pieces to the bottle (this will take a little to lift the tinsel). The final stage was gluing the candy. For this it is necessary to separate the protective film from the other side of each segment of the tape and carefully stick them candy. First you need to glue a bottle of champagne blue satin ribbon. This requires the bottle itself to cover the adhesive and carefully spiral wrap it with a ribbon, leaving only the neck of the bottle. Next, from wrapping green mesh cut out three rectangles with sides of six and ten centimeters. Roll them into triangles and glue to the center of the bottle, placing in a circle. Corrugated paper cut eight petals-the-blanks oval shape with sides six by five centimeters. To pick up two petal, folded them together so that one petal is a little Peeps over the other, then stretch them in the middle and wrap the candy, trying to make it so that the flower looks like a Tulip. Fix "sepal" thread. Exactly the same images to do the other three tulips. Stick with glue the three flowers in the middle of the bottle on packaging of the net. From cardboard cut a circle with a diameter of 10 inches, then in the middle, cut another circle, whose diameter is equal to the diameter of the neck of a champagne bottle. Coat the item with glue and wrap it in a spiral of blue satin ribbon, trying not to leave gaps. A piece of foil 15 x 15 cm are first folded into a square, then make it a semicircle in the form of a cap (in the formation are the most a bottle of champagne or to take any subject rounded shape of suitable diameter). The resulting workpiece is pasted yellow corrugated paper, then combine this stock with the cardboard, forming a hat with a wide brim. Glue one Tulip, made of corrugated paper and candy to the hat. Of beads to make beads. To put on a bottle of beads and made a hat.